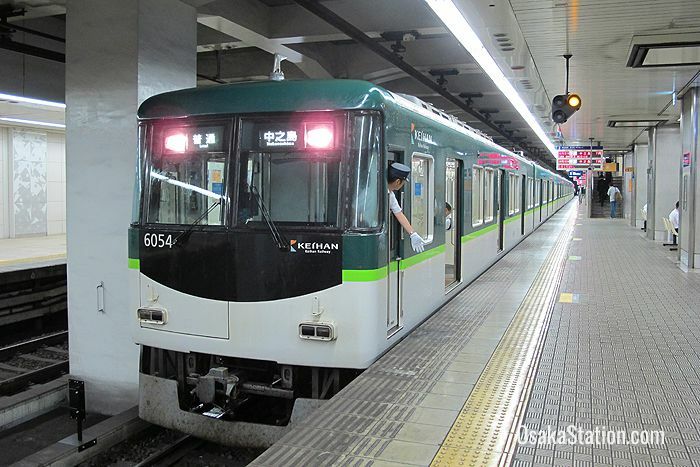 The Keihan Nakanoshima Line is a railway line in Osaka operated by the private company, Keihan Electric Railway. The line runs between Nakanoshima Station in the west and Temmabashi Station in the east. This is a relatively short line and it takes under 10 minutes to travel its course. However, there are several locations of cultural interest along this route, and some recommended hotels too. Also services on this line are all through trains which continue beyond Temmabashi Station on the Keihan Main Line. 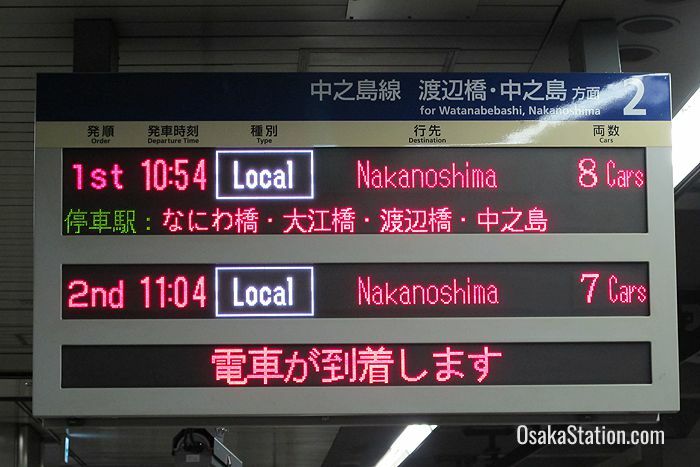 This means that Nakanoshima Station is also connected to major stations in the cities of Hirakata and Kyoto. There are just five stations on the Keihan Nakanoshima Line. 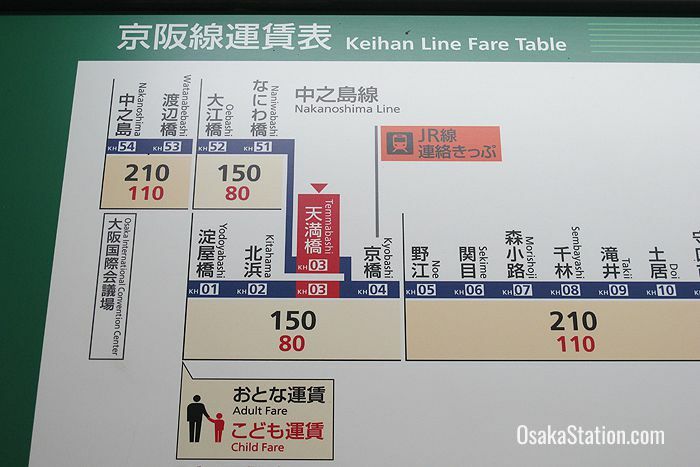 The fares and travel times given below are from Nakanoshima Station. This is the western terminus of the Keihan Nakanoshima Line. Exit here for the Rihga Royal Hotel, Grand Cube Osaka (Osaka International Convention Center), and the party and event space Nakanoshima Garden. Exit here for Osaka Science Museum, the National Museum of Art, and Festival Hall which is the home of the Osaka Philharmonic Orchestra. Exit here for the ANA Crowne Plaza hotel, Osaka City Hall, and Osaka Prefectural Nakanoshima Library. This grand old Neo-Baroque library building dates from 1904 and is a designated cultural asset. Exit here for the Museum of Oriental Ceramics, Nakanoshima Park which is famous for its rose garden, and Osaka Central Public Hall a beautiful Neo-Renaissance building dating from 1918 that houses an exhibition room, concert hall, restaurant and souvenir shop. This is the eastern terminus of the Nakanoshima Line and a transfer point with Keihan Main Line trains headed for Yodoyabashi. You can also transfer here to the Tanimachi Subway Line. Through trains from Nakanoshima continue on to Kyobashi, Hirakata, and several important stations in central Kyoto. For details about services to Kyoto check our article on the Keihan Main Line. Exit at Temmabashi Station for Hotel Keihan and Osaka Castle Park. 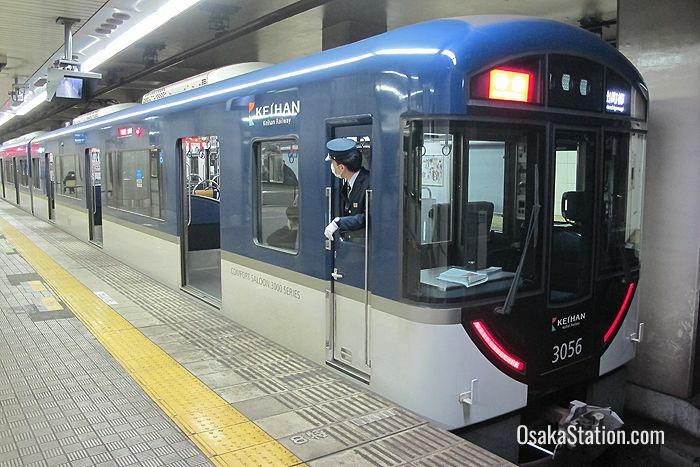 To access the Keihan Nakanoshima Line from the Osaka Station area take a southbound service on the Tanimachi Line from Higashi Umeda Station. Temmabashi Station is two stops away so the journey takes just 5 minutes and costs 180 yen. To find train times and connections quickly and easily use an English language online route finder like Hyperdia or Jorudan. As Keihan Electric Railway is operated by a private company it is not covered by the Japan Rail Pass. However, a one or two-day discount sightseeing pass for the Keihan lines in Osaka and Kyoto and a one-day pass for Kyoto are available. Visit the official Keihan Railway website to find out more. Visitors from overseas can also get a Kansai Thru Pass (also called the Surutto Kansai Pass) for two or three days. This covers not only Keihan railway lines, but many of the private railways, buses and subway systems in Osaka, Kyoto, Shiga, Kobe, and Nara. This pass cannot be used on JR Railways however. Visit the Kansai Thru Pass website to find out more.